Purchased by J. Pierpont Morgan (1837-1913), 1909. Charles Fairfax Murray; purchased by J. Pierpont Morgan (1837-1913) with Murray's collection of old-master drawings in 1909; J.P. Morgan (1867-1943). Ms. antiphonary single leaf (cutting); written and illuminated in Bologna, Italy, last quarter of the 15th century. Musical notation: on verso, three 4-line staves drawn in red ink; neumatic notation. 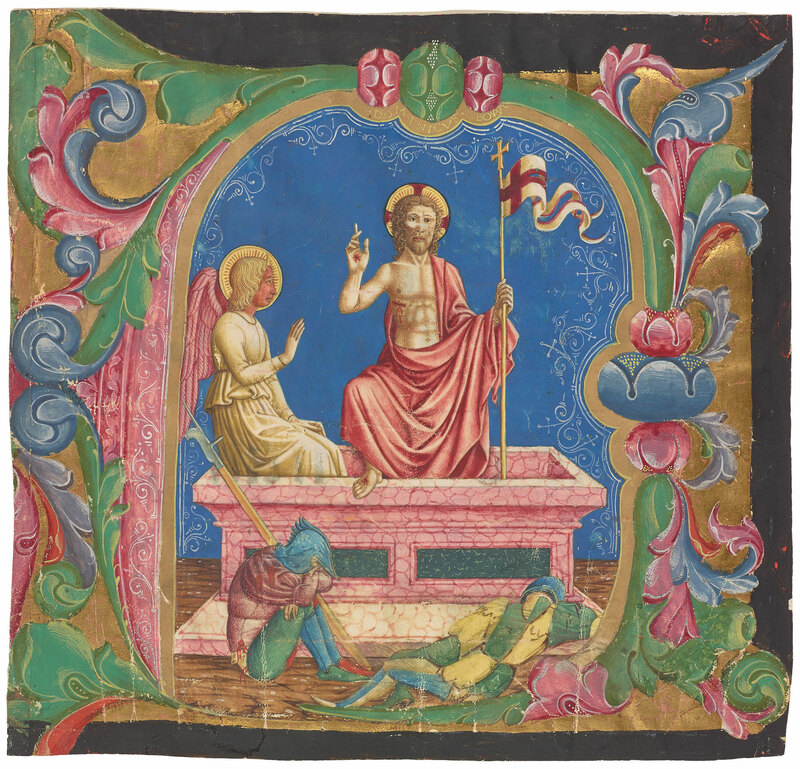 Decoration: 1 historiated initial A (the Resurrection); Italian Renaissance style. Artist: Domenico Pagliarolo; signed on top of the initial A: Dominicus Bon. The letter A (of Angelus) is appropriately illustrated with the Resurrection, for it begins an Easter antiphon that was sung at the hour of Lauds (daybreak), the time of Christ's Resurrection. The illustration is based on Matthew 28:2–3: "An angel of the Lord came down from heaven . . . rolled back the stone and sat on it. His countenance was like lightning (thus the flame-colored face of the angel) and his raiment like snow." The artist, who signed himself as Domenico of Bologna (Dominicus Boñ) in white letters above the head of Christ, was the father of Girolamo, also an illuminator. Domenico also painted a Psalter in 1471 and worked with Taddeo Crivelli on the choir books of San Petronio in Bologna. He was active until at least 1497. The leaf was already removed in the nineteenth century, as Pierpont Morgan purchased it in 1910 as part of the Charles Fairfax Murray collection of old master drawings.